Nowadays, the legal world appears to be like an international and transnational chain of legalities, whose interweaving connects to further scenarios once unknown to jurists (such as the Europeanization of law as a proper field of research, different from international and comparative law). Yet, current theoretical or doctrinal categories of law are at times unsuited to realities, and additional conceptual tools are required in order to cope with present complexity. Legal research is thus called to recognize and comprehend such challenges: recognizing and analyzing diversity hidden under misconceived similarities, as well as identifying common threads in transnational law and in the legal language of high national and supranational courts, international or ‘global’ bodies and authorities and, last but not least, to what extent such a move toward a shared language could affect national habits and foster the social fabric connecting different communities. Against this context, the round table address the styles and mind-set of legal research, the state of the art of legal studies and the teaching of law. It will deal with issues ranging from the role of research in legal studies, to the prescriptive assessment of legal teaching, the increasing process of internationalization and the function of legal scholarship as a sharable enterprise connecting different national experiences. The event, chaired by Gianluigi Palombella, gathers outstanding speakers, who represent leading features of international relevance both in the judicial and academic world. It represents a unique opportunity for the students and faculty of the Scuola, as well as the public who will attend the open event, to approach one of the most fascinating issues of contemporary legal theory in a stimulating and interactive context. Cover: Top to bottom, left to right: Andras Sajo, Professor of Comparative Constitutional Law, C.E.U., Budapest, and Former Judge of the European Court of Human Rights; Giuliano Amato, Judge in the Italian C.C. 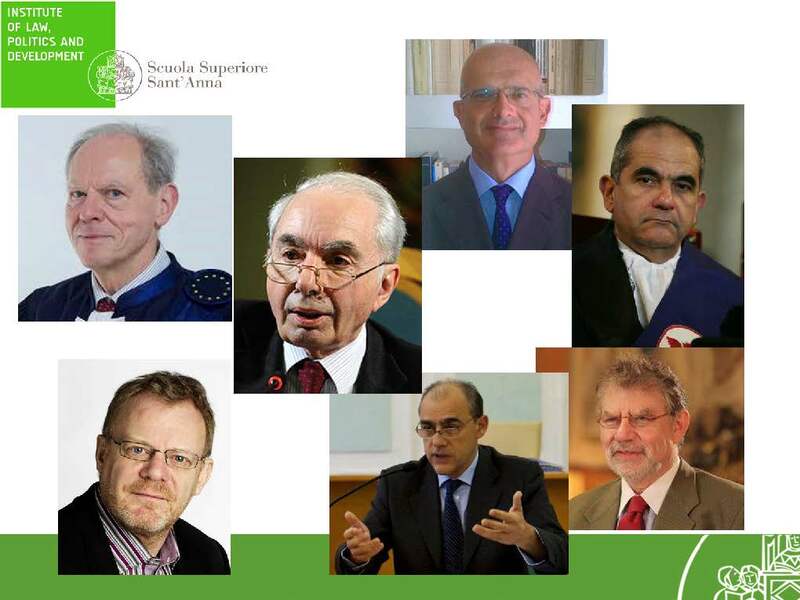 Professor, the LUISS School of Government, Rome; Enrico Scoditti, Judge in the Italian Supreme Court of Cassation; Michele Papa, Professor of Criminal Law, Department of Law, University of Florence; Jan Klabbers, Professor of Public International Law, Martti Ahtisaari Chair, Erik Castrén Institute, University of Helsinki; Gianluigi Palombella, Professor of Applied Legal Theory, Scuola Sant’Anna, Pisa (chair and coordinator); Joseph H. H. Weiler, University Professor, Joseph Straus Professor of Law, New York University School of Law.